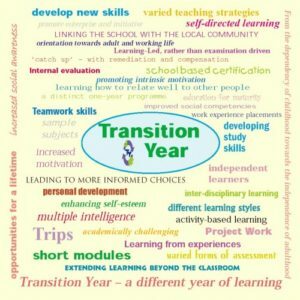 Why Choose Transition Year ? 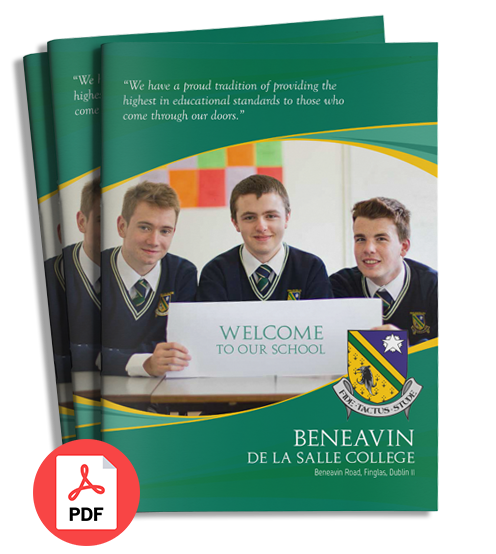 In the Transition Year Programme the pupil will take greater responsibility for his own learning and decision-making. Pupils will be encouraged to participate in learning strategies which are active and experiential and which aim to help the student develop a range of critical thinking and problem solving skills. Work Experience: What is it? “Work experience” involves spending time as part of a school course, learning at first hand about life in a workplace. The employer agrees to co-operate with the school in taking on a student for a work experience placement, usually for about a week or two. The employer knows that he/she is taking on a person as part of a learning experience, not as some form of cheap labour. The placement is part of the school course and offers a great learning opportunity. The employer – who has an enterprise to run – is co-operating with the student with limited direct benefit to the enterprise. Both employer and student will complete a report at the end of the placement. These reports will become important documents for future reference.  Talking about the placement with your family – and friends, if you wish!  To develop an understanding of Community Service in terms of its structure and processes.  To promote development and appreciation of the needs of society among the students. Experience in any of the community care services is a relevant element in the preparation for adult life. Services such as those concerned with social and economic disadvantage, physical, sensory and mental disabilities, and for special groups such as children, the chronically ill and the aged are most appropriate for this preparation. 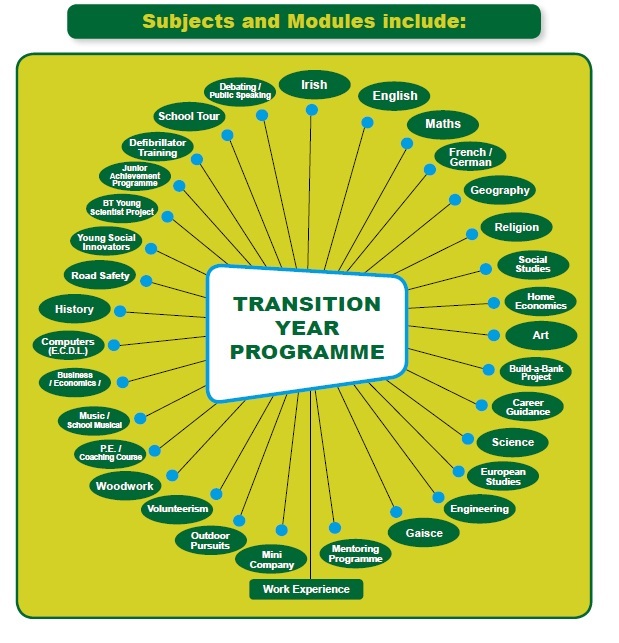 Transition Year provides students with the time to develop their reading and literacy skills. In order to encourage the students to broaden their literary horizons each Transition Year student will be required to read a minimum number of novels throughout the academic year. Students must have their novel with them at all times during the year. Should a teacher be absent or a speaker be unavailable students will continue reading their novel or writing up the book review. We hope that this initiative will foster a love of reading among our Transition Years and that they will continue to develop this interest throughout their adult lives and reap the many benefits which reading provides. Assessment is an integral part of the teaching and learning process at all stages in the school. It aims to be diagnostic, so as to provide accurate information with regard to pupil strengths and weaknesses, and formative, so as to facilitate improved pupil performance through effective programme planning and implementation. The TY curriculum is a balance between the academic and the non-academic and is regularly reviewed and assessed by both teachers and students. As a result subjects on offer are subject to change and revision each year. Assessment is carried out on an ongoing basis and includes school-based assessment of projects or portfolios, oral, aural, practical and written activities. Evaluation of activities such as Work Experience, Community Care, etc. regularly involves the providers/hosts of such activities and parents. Formal exams in core subjects i.e. Gaeilge, English, Maths, Science, European Language and other subject examinations as stated in syllabus. 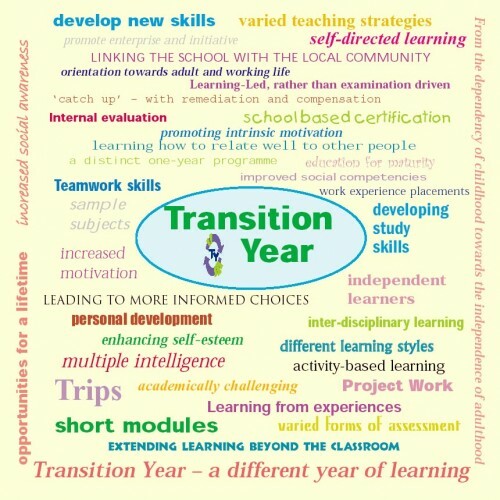 A general certificate of participation in Transition Year will be issued to students on Transition Year Graduation subject to the fulfilment of programme requirements. Other certificates will be awarded, for example First Aid, Gaisce, Young Scientist, Mini-company, and Young Social Innovators, etc. as applicable.